Double Yolk Moon (work-in-progress) is created, performed by, and about two friends, Bex and Sophia. 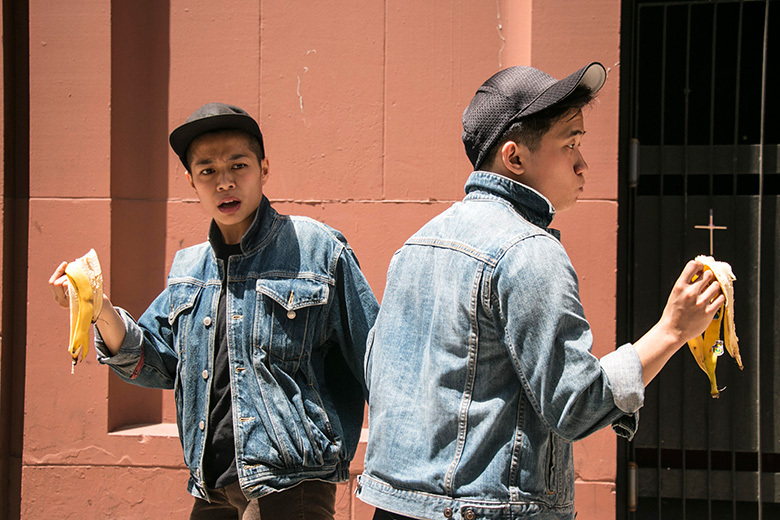 Through shadow, sound, and movement, they unearth family mythologies and histories of foreignness as queer Chinese people in the United States. Double Yolk Moon (work-in-progress) is created, performed by, and about two friends, Bex and Sophia, whose friendship began because people consistently confused them for each other. Lit only by overhead projectors, the performers use shadow puppetry and archival audio to form dreamscapes that explore both the absurdity and revelation of their sameness. The performance is a site of tender resistance and rebellion, where the two friends interrupt stories they have been told about themselves with the stories that they want to tell. Through shadow, sound, and movement, they unearth contradictions in their relationship to family mythologies, histories of foreignness, and kinship as queer Chinese people in the United States. This work was created, in part, with a space grant from BAX/Brooklyn Arts Exchange with support from the New York State Council on the Arts, the NYC Department of Cultural Affairs, and the Jerome Foundation. Bex Kwan and Sophia Mak are not the same person. However, being housemates and friends who are both queer, Chinese, gender non-conforming, and performers of roughly the same height (Bex is an inch and a half taller), people kept confusing them for each other even though they had just met. Together, they peel back their alleged sameness to explore histories of foreignness, family mythologies, and tender friendship. Where will their mirrors of each other fail, and where will they be transformative? Both alumni of EMERGENYC—the Hemispheric Institute New York Emerging Performers Program, Bex and Sophia were a part of Brooklyn Arts Exchange’s 2018 Upstart Program. They were selected for The Brick’s 2018 Trans Theatre Festival and are recipients of the Brooklyn Arts Exchange Fall 2018 Space Grant. Director and dramaturg Mei Ann Teo (she/they) is a theatre/film maker who works at the intersection of artistic/civic/contemplative practice to shift culture towards justice and compassion. As a director/devisor/dramaturg, she collaborates across genres, including multi-form performance, music theatre, and intermedial participatory work. She was featured at MIT’s Symposium Next Wave: The Future of Asian American Theatre, is a National Directing Fellow, and profiled in American Theatre’s Role Call: Theatre Workers to Watch. Teo’s work has toured the U.S. and at international festivals including Belgium's Festival de Liege (Lyrics From Lockdown, “Truly polished, meaningful and entertaining” -New York Times), Edinburgh (MiddleFlight, “Stunning” -Scotsman), M1 Singapore (The Shape of a Bird, "Superb staging" - Straits Times), and Beijing (Labyrinth - Top 8 in Beijing News). She has developed new work across the country, including the Oregon Shakespeare Festival (Phil Killian Fellow), Goodman Theatre, and Berkeley Rep. Recent and current work includes: the world premiere and 25 city tour in China of Dim Sum Warriors by Colin Goh and Yen Yen Woo (composed by Pulitzer Prize winner Du Yun), Diana Oh’s Clairvoyance at ART Oberon, Jillian Walker’s Songs of Speculation at JACK and SKiNFoLK: An American Show at SPARK festival and MTF, Nia Witherspoon’s Dark Girl Chronicles at BAX, JACK and Playwrights Realm, to premiere at The Shed, Double Yolk Moon with Bex Kwan and Sophia Mak at BricLab and the Highline, and Madeleine Sayer’s Where We Belong at the Globe in London. Her short film, Let Me Kill My Mother First, is an official selection of the 2018 Singapore International Film Festival. Mei Ann is the Producing Artistic Director of Musical Theatre Factory, a Resident Company of Playwrights Horizons.